Sunday September 20, 1:00 p.m. – 4:00 p.m.
Bring show-and-tell to share your past year of fiber projects, and bring guests. Spinning wheels and looms are encouraged so guests can see what a fiber guild is about. We and our guests will enjoy seeing what you have been up to. Things are changing in the Huntsville Fiber Guild. Learn about upcoming programs, workshops and benefits of guild membership. The Tennessee State Fair has fleece and spinning competitions and a fleece auction. Fiber events are September 16 and 17. Wednesday starts off with the fleece show. Last year, there were around 230 entries. They have classes for many specific sheep breeds, alpacas, and llamas, as well as general classes for handspinning fleeces and commercial fleeces. Anyone is welcome to come watch and ask questions. Thursday evening, there is a Spinning Contest, followed by the Fleece Auction at 7:30. For more information go to tennesseestatefair.org and click on COMPETITION. You will find the Fleece Department listed under Livestock. If you are interested in car-pooling to the fair, please contact theGuild and we will try to coordinate rides. The Guild had a wonderful workshop with local Felting Artist Kami Watson. 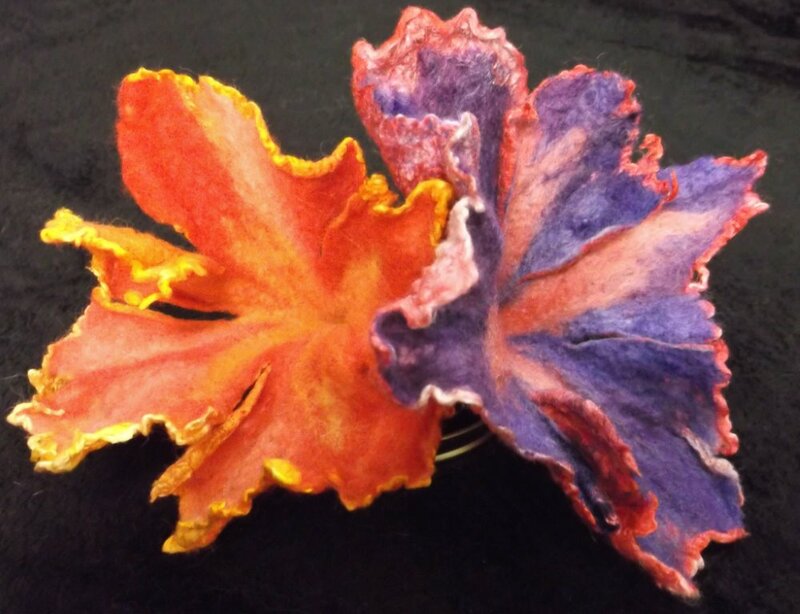 She had a great technique to produce nuno-felted flowers from silk caps and custom dyed merino. Everyone left with several colorful flowers. We can use the flowers to embellish hats, scarves, or bags or as centerpieces. She also showed us some of her lovely nuno felted scarves and clothing items. Check out her studio to see her work at Lowe Mill (2nd floor).